It is hard, if not impossible, for a marketer to finish their first cup of coffee in the morning before they either send out an email campaign or work on a content piece. And when you combine email and content marketing strategies, you are guaranteed to have a great morning! Email and content marketing is the perfect combination, like peanut butter and jelly, Batman and Robin, hamburgers and fries, and Han Solo and Chewbacca. Like any great combination, you could have just one, but why? 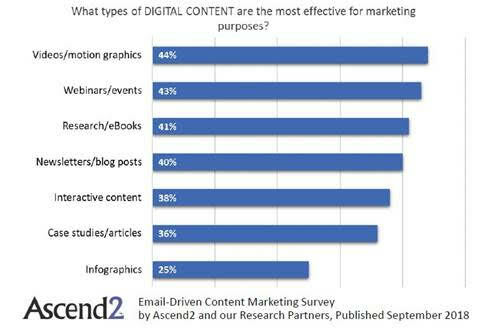 A recent Ascend2 research study, Email-Driven Content Marketing, examines how marketing professionals are combining email and content marketing, to determine what an effective email-driven content marketing strategy looks like. The survey was fielded the week of August 27, 2018, and a total of 224 marketing professionals participated. Grab a cup of coffee and review the following research findings and consider how you can adjust your strategy to optimize results. Email is clearly considered a most effective channel for marketing content to prospective customers by 82% of marketing professionals. The next most effective channels are social media and a company’s website or blog for 54% and 51% of marketing professionals, respectively. 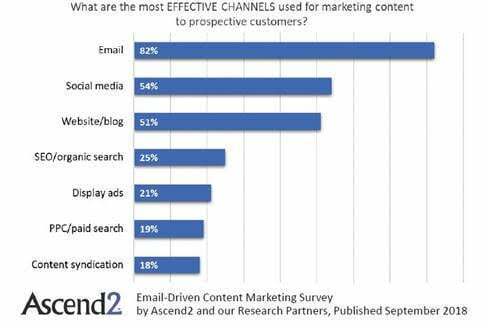 The importance of email is consistent in various Ascend2 research studies on content, email, data, and technology. 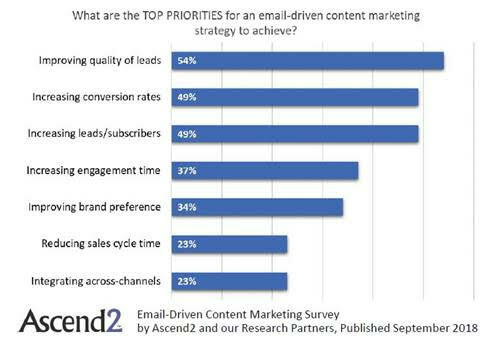 Improving the quality of leads is a top email-driven content marketing strategy priority for a 54% majority of marketing professionals. Increasing conversion rates and the number of leads or subscribers generated are also top priorities for 49%. When considering your content & email priorities, you should examine your content. If you want to improve the quality of your leads and increase conversions, you need high-quality content. Your content needs to be laser-focused on your audience. Determine the various segments you want to reach. Just like you segment your email list, segment and personalize your content. What content types should you create? Here is what the research study revealed that works best for marketing professionals. Videos or motion graphics are considered the most effective types of digital content used for marketing purposes by 44% of marketing professionals. Nearly as effective are webinars or events, and research or eBooks for 43% and 41% of marketing professionals respectively. Report: Create a report that is easy to scan and helps the reader answer questions that are important to them. Video: Many people would rather watch a video than read a report. So give them what they want with a video format of your research. Webinar: Your research is an ideal tool to set the stage for the topic of your webinar. Use your research to identify a problem or opportunity and your speakers can provide expert advice on that topic. Blog posts: A quick review of a research chart will inspire a blog post. If you have eight research charts, that is eight blog posts. Infographic: A picture is worth a thousand words. Use your research to tell a story visually. 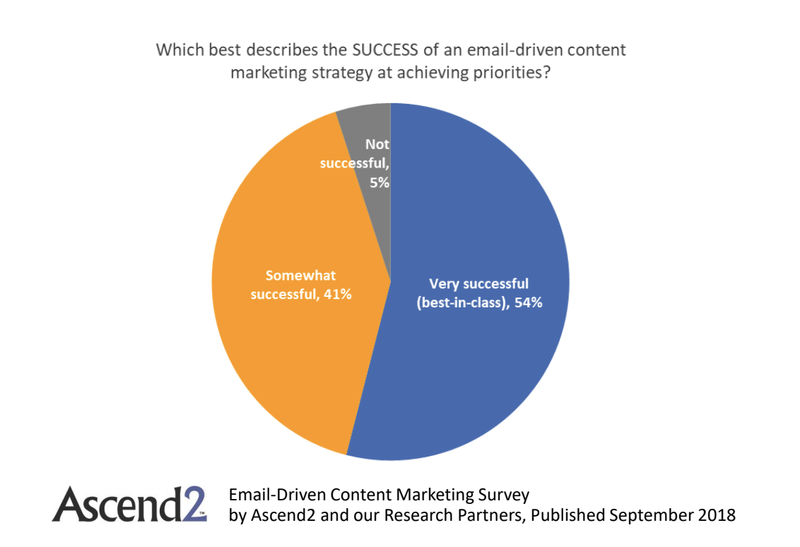 More than half (54%) of marketing professionals consider an email-driven content marketing strategy to be very successful at achieving priorities. 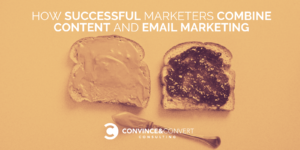 So keep combining email and content marketing–it is a great combination! You can review the entire Email-Driven Content Marketing Survey Summary Report for guidance on creating your email and content marketing strategy.